Two Twitter handles, @MarcMarinelli and @IkeFootball1, encapsulate the rise and uniqueness of the Goddard Eisenhower football program. Marinelli’s page features a massive main photo of his team celebrating one of its two program-defining road playoff victories against Kapaun Mount Carmel and Maize South in the past two Fridays. As well, Marinelli’s avatar shows him with his trademark lumberjack beard talking with a player. The short biography lists Marinelli’s love for the Wu Tang Clan. Earlier this season, a Twitter post reminded the school to dress up like their coach for a day with his usual beard, headset, sweats and no socks. The feed is constantly updated; Marinelli is arguably the state’s biggest Twitter user among football coaches. Marinelli’s three children, @MarinelliKids, even have a Twitter account. The other account, for the football team, features another big celebration photo, and a line: “IKE VS. THE WORLD,” a moniker that Marinelli says the team and school “absolutely” use. 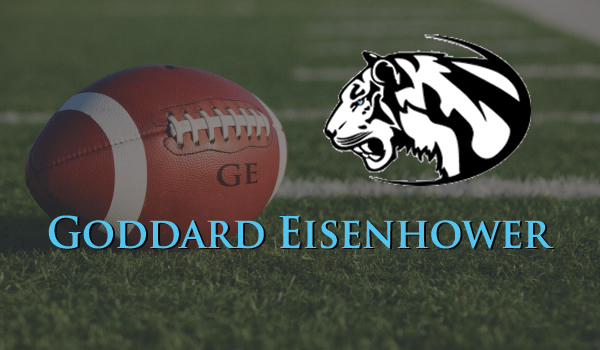 Eisenhower, which finished 1-8, 2-7 and 2-7 in its first three years of existence (the last two under Marinelli), stands at 7-4 and in the Class 5A semifinals with a home game versus No. 2 Bishop Carroll (10-1), the defending state champion. At the start of the season, Eisenhower was not projected as a playoff team and was selected fifth in its own league, AVCTL II. Eisenhower is 0-2 all-time against Carroll with the last loss a 56-21 defeat in 2013. Marinelli, a Mulvane graduate, had coached at Andale before a 21-11 record in three seasons at 3A power Hesston. Then, he took over a 1-8 Tiger program in its second year of existence. Marinelli wanted to be in the weight room full time and have a big challenge. “A part of me that really, really wanted to try to create something out of nothing,” he said. Entering this fall, Marinelli said he was “dangerously optimistic” about his squad’s chances. Marinelli believed Eisenhower had the talent and the work ethic in the weight room and practice field to take the next step. Eisenhower opened 3-3 with wins by a combined 16 points. The Tigers clinched a playoff spot with a 42-22 victory against Arkansas City, and 27-6 versus Liberal before a 34-19 Week 9 loss to rival Goddard. In the last 10 years, Eisenhower is the fourth 5A semifinalist to miss the playoffs the year prior to reaching the Final Four. However, the Tigers are the first 5A squad since Topeka Seaman went 1-8 in 2004 and then finished 9-3 in 2005 to reach sub-state with fewer than three victories. Eisenhower’s secondary, self-referred as Area 51 for being a “no fly zone,” led the way with a 20-14 victory versus Kapaun and 16-0 against Maize South. In both games, Eisenhower was a double-digit underdog by Prep Power Index. Last week, Eisenhower and 2-1A Phillipsburg were the only underdogs 5A through eight-man to win. The veteran unit held Division I-caliber quarterbacks Brock Monty and Korie Frausto to 14 of 33 passing for 140 yards with one touchdown and one interception. The signal callers rushed 42 times for 176 yards and no scores. The secondary features senior safeties Noah Strunk and Brett Huelsmann and also includes cornerbacks Drake Damon, Nick Henning and Tanner Orand. In Week 3, Eisenhower held off Maize South, 29-20, when the defense forced multiple turnovers. On Friday, the Tigers forced five Maverick turnovers. Marinelli called the defensive effort one of the best he’d ever seen. The Tigers played disciplined football versus Frausto, who entered the game with 1,585 rushing yards, and controlled the line of scrimmage. Damon returned a blocked field goal 93 yards for a score versus Kapaun. After Maize South, Marinelli sent a tweet to Damon complimenting the senior on his play and leadership and vital areas. Marinelli who said Damon “does everything for us,” and “doesn’t stand out,” also starts at receiver and carries the ball some, too. He leads the team with two kickoff return touchdowns and in special teams tackles. The offensive line has quietly put together a great season. The line didn’t allow a sack until Week 9 and has permitted just two all year. Parker Jones starts at left tackle, Cory Kidd at left guard, Cameron Bradley at center, Jake Homas at right guard and Jack Scott at right tackle. The average size is 205 pounds, likely the smallest line in the 5A playoffs. Junior quarterback Mason Madzey, the starter since midway through his sophomore year, has the option game effectively with more than 1,600 total yards. Madzey has shown good touch on his passes and been a standout leader. Marinelli has even allowed him to call some audibles. Senior Joseph Weibel, a first team all-City League linebacker transfer from Wichita Northwest, is Eisenhower’s first 1,000-yard rusher with 1,100 yards and 11 scores. He took over at fullback when the expected starter went down with an ACL injury in the summer. Senior defensive end Jake Daugherty is the leading tackler with more than 100 stops. Like Damon and much of Eisenhower, Marinelli called Daugherty an unsung hero. One of the underlying themes for success in 2015 is scoring on defensive/special teams. Many of the squads playing this weekend, especially 6A Olathe North, 3A Collegiate, 8-man I Hanover and 8-man II Argonia-Attica, have significantly increased its defensive/special teams scoring. Hanover has set several passing records with junior quarterback Will Bruna. However, the Wildcats have 11 touchdowns on defense or special teams, including an eight-man state record seven interception returns for scores. Three eight-man squads had five, most recently Deerfield in 1994. Argonia-Attica has five safeties, also tying the state mark by the ’94 Deerfield team. The Titans have scored tallied nine scores on defense or special teams. Last year, the Titans lost the special teams battle to Victoria in the 8-man II championship. A&A had one safety and five defensive/special teams touchdowns in 2014. Collegiate has had two defensive/special teams scores and blocked a punt in last Saturday's win against Norton. Spearville, which faces Hanover for the 8-man I title, has seven, one more than 2014. Olathe North has five, including three kick return scores last week in a 44-30 victory against Shawnee Mission East. SM East had a 175-yard edge in total yardage and an incredible 89-26 advantage in total plays, but the kickoff returns made the difference.